For the most part, the different Internal Arts families of Hsing I (XingYi), Pa Kua (BaGua) and Tai Chi (TaiJi) have in common primarily three types of weaponry training. They are: the straight sword (Jen), the curved sword (Dao) and the long spear (Chiang). But that is not meant to imply that the Neijia Arts do not cross train other weapons as well. 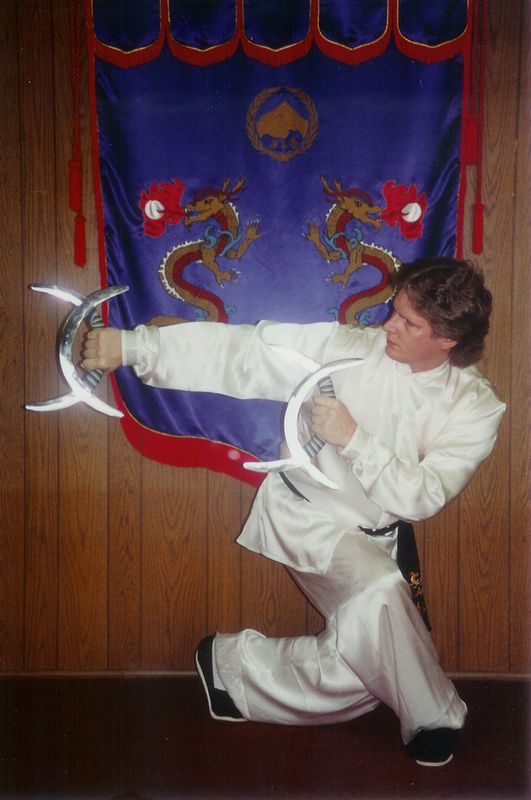 For the purpose of the following section, I have chosen to discuss the weaponry training of Hsing I (XingYi), Pa Kua (BaGua) and Tai Chi (TaiJi)as it exists within my own family, as it would be too difficult to attempt a contrast of all the existing philosophy governing this subject within each separate lineage. straight sword as a combative weapon. BaGua Straight Sword (Jen) - This set is beautifully fluid and contains some very good combative concepts and applications. It is a practice that all people when witnessing it are instantly drawn to, but the nuance of motion within the form thwarts most people quite quickly when they attempt to learn. For those who are able to stick it out and complete the set, the rewards are numerous. TaiJi Straight Sword (Jen) - This set focuses on a variety of different tactics, but one of the most striking when witnessing the practice is the smooth insertion followed by a rapid slicing cutback of motion. As is typical of most Taiji forms, the set is quite long and only somewhat repetitive. XingYi Sabre (Dao) - This is not a weapon that Xingyi is widely known for. It has not been largely disseminated to many people in recent history. The techniques are direct, simple and effective. The set makes good use of the body mechanics and stepping patterns of Xingyi. BaGua Sabre (Dao) - This type of Sabre (Dao) is much larger than the sabre used in most systems. The Bagua Dao is typically approximately two thirds again as long as the average sabre in Internal Martial Arts practice. This of course tends to increase the weight substantially and makes the weapon difficult for the practitioner to wield. Hence the movement structure tends to make use of existing centrifugal force to keep the oversized blade moving fluidly within the form. TaiJi Sabre (Dao) - This is again a multi-directional, multi-concept form. It contains numerous possibilities for utilization of the sabre in combat and is appropriately challenging from a performance perspective. XingYi Spear (Chiang) - The Xingyi Spear is not something that is flamboyant in appearance. The function of the practice is to help crystlize the concepts of power derived from the Five Forces of Pi (splitting), Pao (pounding), Tsuan (drilling), Heng (crossing) and Peng (crushing) in the practitioners mind, so that the understanding gleaned from the spear practice can then be put back into the hand sets to strengthen transferance of energy. This is not to say that the spear techniques are not functional. Indeed, they are quite practical, but not extraordinary to look at. 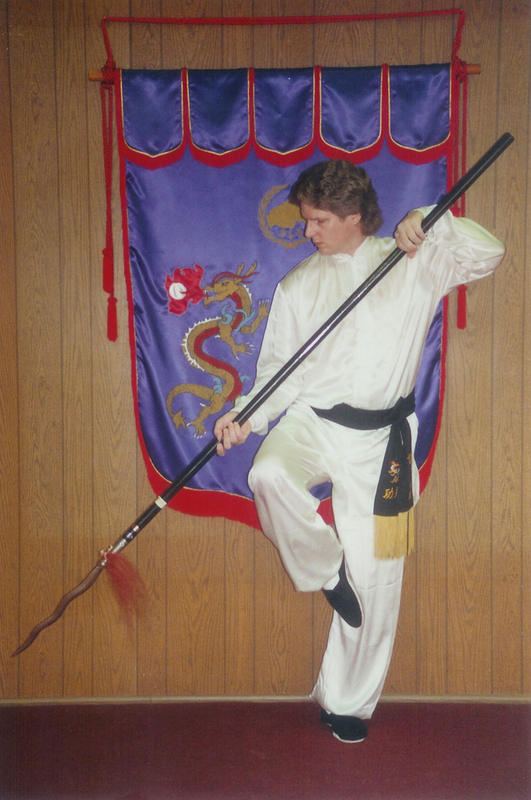 TaiJi Spear (Chiang) - This spear set places a great emphasis on body connection to the spear as is evidenced through the practice. The flavor of the form is dramatic expression of energy through large fluid movement, with the occasional punctuation of an abrupt issuing of energy within the frame. This set requires a great deal of room to exercise as the weapon of choice is quite long and it tends to move in multiple directions with numerous broad, sweeping changes of technique and alignment. XingYi Staff (Guen) - This set is characterized by strong, quick motions, precise double end usage, coupled with occasional rapid hand changes to avail usage of a single end for long range tactics reminiscent of the spear. It contains a multitude of unique tactical applications. It is quite a lengthy routine for a Xingyi weapon set, contrasted to some of the other weapons routines in the system. BaGua Staff (Guen) - This is a very fluid set, emphasizing double hand usage and multiple interwoven circles. A very typical representation of the fluid, centrifugal power found in Bagua. In our family we use this as a beginning staff set as it does a fine job of covering all the primary techniques of the weapon. XingYi Long Sword - Characterized by exceedingly strong, two handed usage of power derived from the Five Forces of Pi (splitting), Pao (pounding), Tsuan (drilling), Heng (crossing) and Peng (crushing). In many families, the Two Hand Sword is taught much like the Xingyi Spear in that there is no real set, but rather a system of five movments. However, in my family there is a set based upon the five forces taught in addition to the linear single routines. BaGua Crescent Swords - This set is, at this point in time, quite rare outside of certain circles of practitioners. The routine is characterized by complex bilateral usage of the two Crescent Swords within a dynamic structure of tightly twisting footwork and strong centrifugal force that is synonymous with Bagua.